The master of suspense made 54 feature films during his very long and celebrated career. 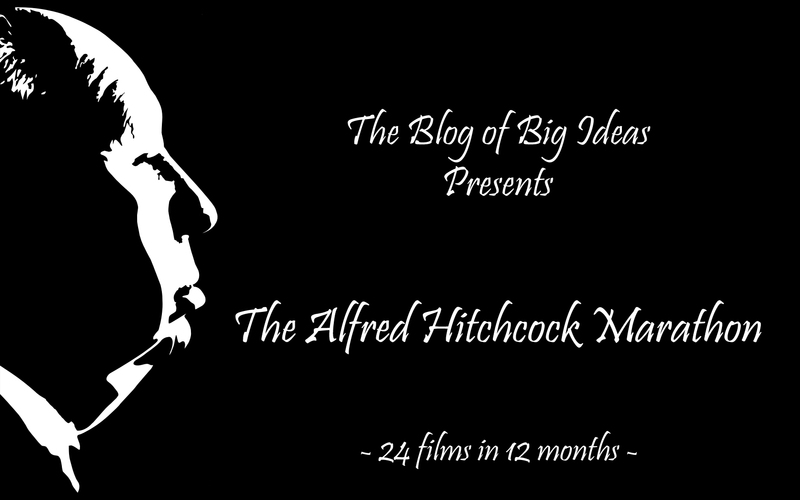 Having only seen a couple of his films before I started this challenge, it is time for the author of this blog to become a lot more familiar with Mr. Hitchcock. The minimum goal will be to watch and review at least 24 of his films in 2013, though I will try to aim for 30. I will start with the must-watch classics, slowly making my way to the lesser known part of his work. There is a very famous sequence in Alfred Hitchcock’s North by Northwest that illustrates the abilities of the film-maker and the value of this piece in the history of cinema. The scene comes about halfway into the film, shot outside the major studios in some nondescript part of America’s countryside. Roger Thornhill (Cary Grant), a man with a case of mistaken identity, waits by the side of the road in his elegant suit. He traveled to this spot to finally meet the spy he has been confused with. He anxiously awaits looking up and down the deserted road, while a distant plane sprays fertilizer and the occasional car interrupts the silence while zooming by. Soon the tension rises as a vehicle approaches along a dirt road directly across from our point of view. Much to our protagonist’s surprise, the driver of the mysterious vehicle drops an unsuspecting older man (who doesn’t look like much of a spy) across the country road. Could he be our spy or just another chance encounter Hitchcock places to toy with his audience? Before we know it, the master of suspense throws a little surprise that results into one of the most iconic chases of all time. Hitchcock knew how to have fun behind the camera. Often he took risks, playing around with camera angles, composing the shots in the most effective way he could, and surprising audiences as a result. Hitchcock also knew how to keep things light, with an ever present comedic undertone that released the pressure even in the most suspenseful sequences. 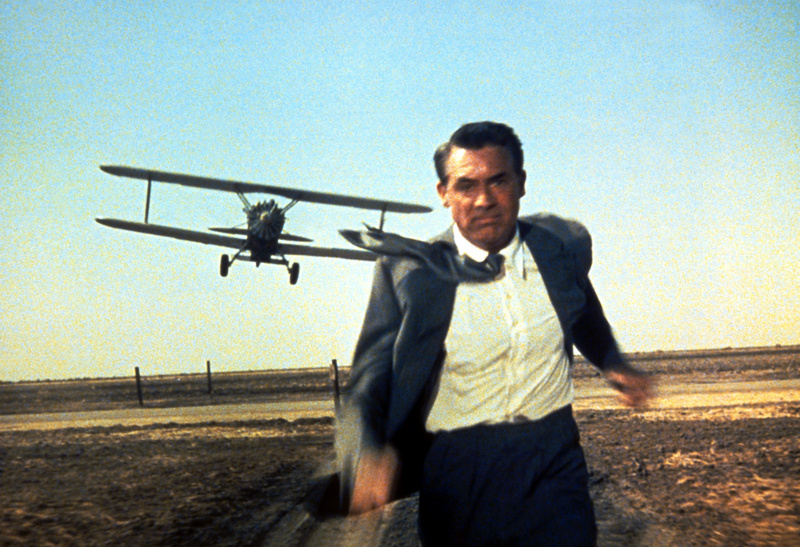 While North by Northwest may not be his single greatest achievement, the film encapsulates, perhaps better than any other in his oeuvre, the ability of the film maker to combine comedy and suspense through perfectly cast actors and cleverly built sequences. Robert Bresson often referred to his actors as little more than nameless props he used to tell a story. Hitchcock was on the other side of the spectrum, relying heavily in the abilities of his cast. In almost all of his films, he managed to get the best out of his actors, placing the effectiveness of the piece on their shoulders. He once said good casting saved him a few minutes of film. Good actors were capable of expressing what Hitchcock desired without the need for words. 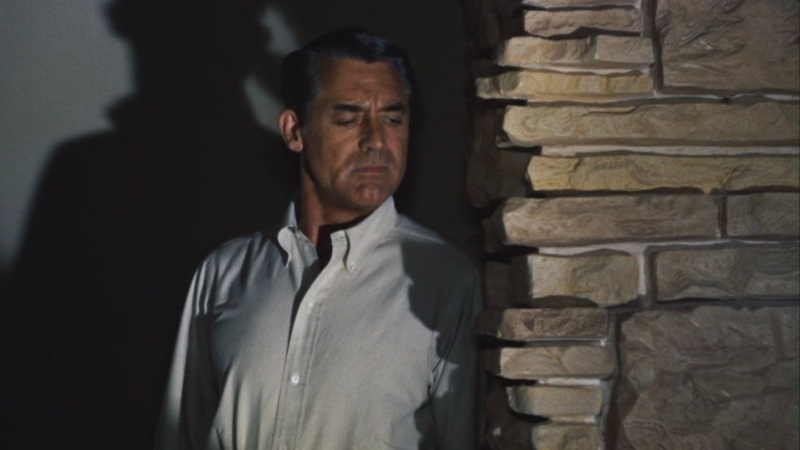 This is obviously true in North by Northwest as Cary Grant, who is in nearly every shot of the film, provided the perfect outlet through which to convey tension and comedy in equal measure. Even on those overly staged and anticipated scenes, Cary Grant managed to distract our attention from the overly conscious direction Hitchcock would sometimes take. Grant was everything Roger Thornhill needed to be: a confident businessman who was suave, elegant, charming and despicable all at the same time. There is a touch of flare that could easily be deemed unnecessary in the film. The dialogue is illustrative of this, often coming across as a bit too witty for its own good. Sometimes Hitchcock’s films might have benefited from a little less cleverness and a little more simplicity. It may not be everyone’s experience with North by Northwest, but I see more value in the great collection of memorable scenes than in the ability of Hitchcock to take us through all of twists and turns in this entertaining spy-thriller. Before I’m indicted by my peers, I mean this in the best possible way. Hitchcock constructed entertaining stories, this one anchored in his phobia of being wrongfully accused; but his forte, his true genius, lied in his ability to create visually inventive sequences of film that will forever live in the memory of pop culture. Rating: 4/ 5 – inmensely entertaining, great cast, an early lesson on how to make a thriller, not to mention a few memorable scenes. – A review of the harrowing Platoon as part of my IMDB Top 250 challenge. Boy, I have a lot of catching up to do on Hitchcock, I’ve only seen 2 of the 10 you listed! I do like NBNW, perhaps one of my fave Cary Grant roles. To Catch A Thief is kinda forgettable for me though, though Grace Kelly is just so stunning! This is one I ought to give another viewing to. It was one of my first Hitchcock films, and while quite good, I would put it a notch below his greatest work. As you said, though, it has a number of memorable scenes, and Cary Grant was terrific. I rewatched North By Northwest this year, and it holds up for me, the pacing works so well, never bored. My only minor complaint is the ending, which is a tad rushed. I like the twists and turns of the story you mention. Hope you enjoy your Hitchcock marathon!